Day 28: Should technology drive curriculum, or vice versa? Curriculum should drive technology - Technology is a tool. It can be used (often very effectively) for students and teachers to share their learning, connect with others, communicate, collaborate and create. For many students, technology engages them and allows them to share their voices in ways they never dreamed possible. Technology should drive curriculum - Our students will need to use technology in many aspects of their lives. Our curriculum needs to keep up. The Ontario Media Literacy Language strand is outdated. I'd love to see responsible digital citizenship built into our curriculum. Too much. I've said it before and I'll say it again, I have a lot of trouble turning of my teacher brain. That's probably good for my students, as I'm basically always thinking about them, but it's not always great for me. Or for my in-person relationships. I spend a lot of time online, reading, watching, writing, planning and sharing. I like to be easily accessible to co-workers, parents and students (current and former). A lot of my "downtime" is spent up - reflecting, planning and thinking. That means I spent evenings, weekends and holidays working. I have this ridiculously awesome team of people behind me (partner, friends, colleagues, professionals) and all of them push me to look at my life and find a better work-life balance. The problem is, my work IS my life. That might sound lame, but I really, truly, madly, deeply love what I do and love learning from others and pushing myself to be better. Because I am aware of the potential to burn out, I try to listen to my team and take some time for pleasurable, happy-making activities. Even if my teacher-brain is still on, I value the time I spend tuned into real live human people who love me. I need to do a better job showing them that. That said, my mom and Captain Handsome need me right now. The rest of my blog catch-up can wait! Day 25: The ideal collaboration between students - what would it look like? This month, the Gladiator Snails brainstormed what great groups look like. 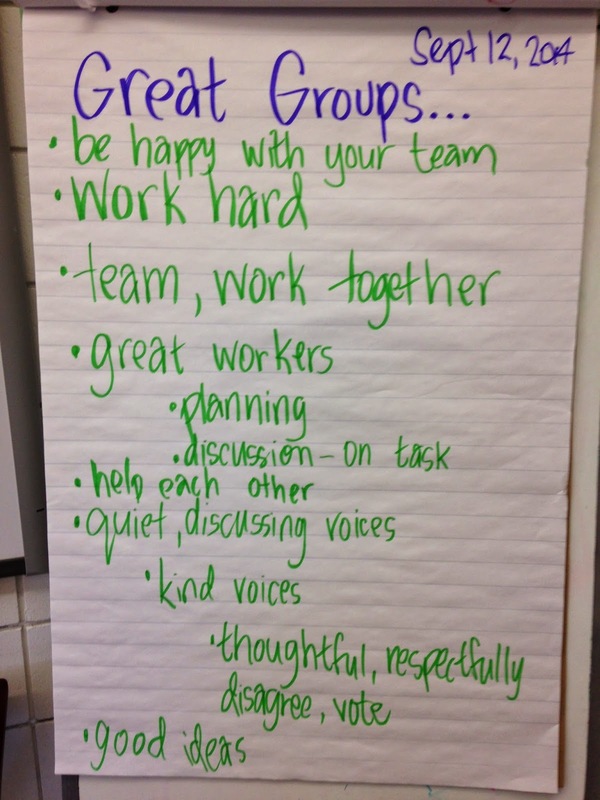 As we've been working in groups all month, we regularly refer back to this list. I think they hit on most of the qualities that make ideal collaboration between students, but I'll add a few of my own. I love pushing myself and my students to collaborate. The smartest person in the room IS the room. That's not to say four physical walls are sentient, but that when people get together, their ideas get better. I know that is the case for me through collaborating in person and online. 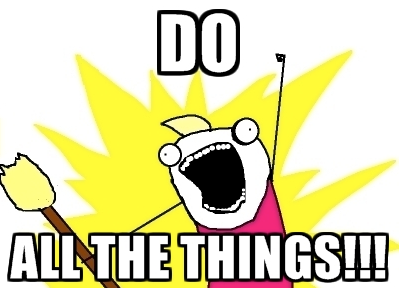 Day 21: Do you have any hobbies/interests that you bring into your classroom teaching? Explain. I'm into a lot of things. Most of them make their way into my classroom in one way or another. I can't really turn off my teacher brain, so even when I'm doing something that is happy-making for me, I'm thinking about how it can make things more engaging, innovative or educational for my students. Octopuses: I have a lot of interesting octopus stories and facts because I'm fascinated by the eight-legged wonders. My students get used to hearing about octopuses and know, from the first day, that I'm in love with them (although, this year, it was slightly less apparent for them - usually I wear my custom-made octopus necklace on the first day. After a request to wear it on the last day last year, I broke it while dancing. I have to get it repaired so the Gladiator Snails can see it!). Over the years, I have collected (and been thoughtfully gifted) a number of octopuses that are displayed on a shelf in the room. Tech: I love playing with new tech tools and toys and bring them into my classroom for my students to figure out along with me. 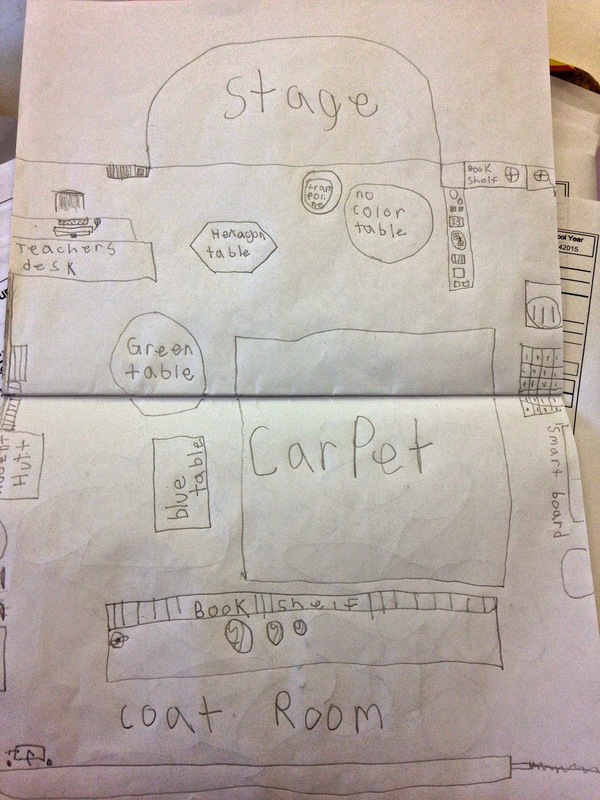 I've learned about blogging, Sifteo tiles, iPads, Skype, Chromebooks, Sphero and MaKey MaKey with my students. Things that I can't get my hands on (like outrageously pricey Google Glass, drones and 3D printers), I share with my students through videos, articles and imaginative discussions. Disney: This one has been more closeted in the past, but has come proudly to the forefront this year. Walt Disney has always been a hero and an inspiration for me and it's only in the past year that it became totally obvious how wonderfully his philosophies fit into mine in the classroom. Our EPCOTclass is modelled on Walt Disney's ideals of dreaming big, storytelling, creating magic, authentic collaboration and bravely going against the expected. Once a student at the school where I currently teach, I signed out a lot of books from our school library, in the old fashioned way - on library cards in the back of books. A student last year discovered my name written in the back of a Walt Disney biography she signed out. I did a lot of projects on Walt as a kid. Puppets: I've always loved the idea popularized in "The Velveteen Rabbit", "Winnie the Pooh", "Toy Story" and other tales of stuffed animals coming to life on their own - especially while unwatched. Puppets give me the ability to make that happen in a tiny way (stop motion could make it happen, too...hmmm...future project?). I think Jim Henson's Muppets are so incredibly gorgeous, enchanting and alive that when I found "The Muppet Workshop" at FAO Schwarz in NYC, I nearly lost my mind. I created Norman several years ago and he lives in my classroom (he doesn't know Math, so we consider all the things he can't do and we try to teach him). Last year, Norman got a friend, a beautiful purple monster named Hedwig. 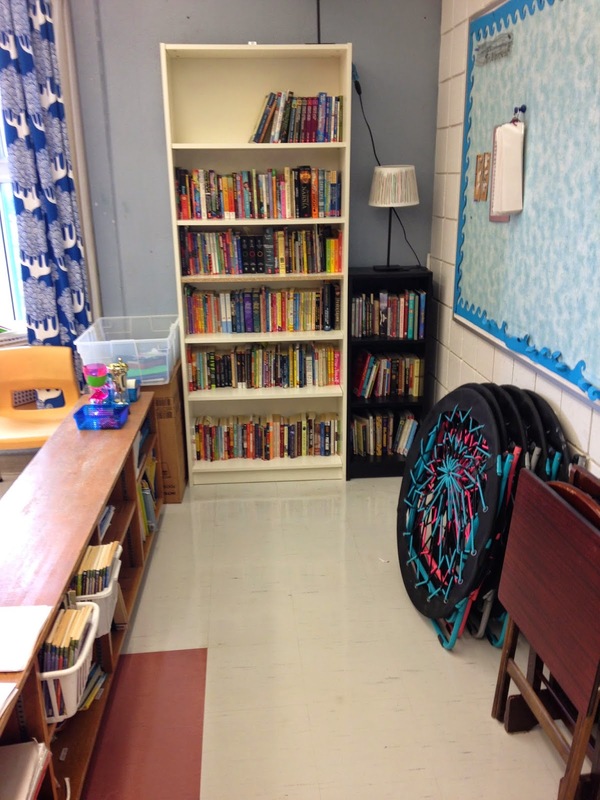 She's shy about reading, but loves when students sit with her to read and learns from their efforts and confidence. Norman and Hedwig have become cherished (and hilarious) classmates. Travelling: I LOVE to travel. I love sharing with my students about the way my perceptions of myself, my culture and the world change through my adventures. Getting to relive amazing journey by sharing stories with my students has been a gift. Since my first year of teaching, I have gotten to know my students at the beginning of the year through "Pieces of Flair". We each bring in items that represent us as people and display them in our classroom, making it ours. This post is basically a list of (some of) my flair! It's wonderful to be able to share my passions with my students and learn about theirs. If teaching is all about relationships (which, honestly, it is), then building relationships with whole people (not just who they are in the context of a classroom) is crucial to reaching all students. I thought some of the earlier posts were hard but this one is the hardest by far. I am hyper aware of what how people perceive me or how I think they might perceive me. Every time I thought of a strength, I figured there could be somebody who would read this post and think, "No, that's not accurate," or come up with a time when I didn't demonstrate that quality and be critical. I think that's a problem. I'm not writing this blog or doing this challenge for anyone else. I'm doing it for myself. In that way, it doesn't matter if others agree with these ideas, below are three strengths I feel benefit in my career as an educator. I like trying new things and being challenged. I can get through to a lot of kids. Use: Creation and collaboration. Students effectively create slideshows, surveys, documents and drawings on the Google Drive. They can easily share them with their teacher and peers for help, feedback and to work together. Effectiveness: Green light - once you learn how to log in to your account, transferring word processing skills from Microsoft's publishing suite is simple. Students consistently discovered new features and shared with one another. So empowering. Effectiveness: Once they're up and running - green light. My current 3/4s still need to do their training before we're off and running. Teachers need to carefully monitor on-task work! Use: CREATION! We use our class iPads (Isaac, Ivy and Ilys, and our class iPod, Itty) to create. We love apps like Puppet Pals and iMovie to create videos that we share with our school, families and the world. We've created stop motion films of our class pets, clubs and daily activities. COLLABORATION! We meet with other classes from around the world to work together and play games (like Mystery Skype). Students who are not able to be in class (on holidays, illness) join us on Skype. Parents and families near and far Skype in to see what we are up to! We share our ideas on Twitter and our class blog and seek feedback. Effectiveness: Green light - super easy to use, intuitive, good battery life, with the iGuy Speck case, iPads are sturdy and are carried around the school like members of our team! Effectiveness: Yellow light - since my classroom computer needs to be replaced, my daily use of our projector is temporarily limited. 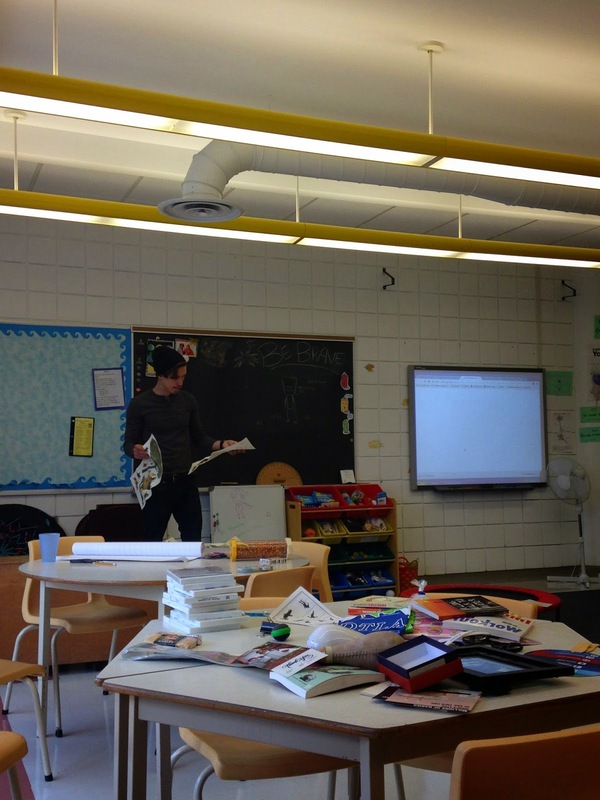 I do not use the Smart Board effectively yet. We play with the touch screen ability sometimes, but I am not terribly comfortable with the system and miss out of what are surely lots of great learning opportunities. Some other tools we started to play with last year and I hope to explore more this year include: Our Sphero, our MaKey MaKey boards and Sifteo Tiles. These are awesome maker tools. 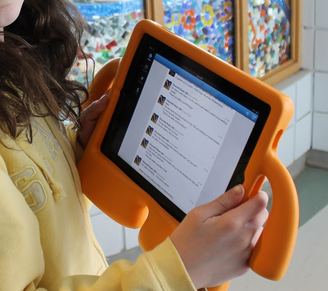 Overall, I love how using tech in the classroom can help engage kids and make them creative, critical thinkers. I was recently having a conversation about exactly this. In the next five years, I hope to continue to develop my own practice and help others to do the same. 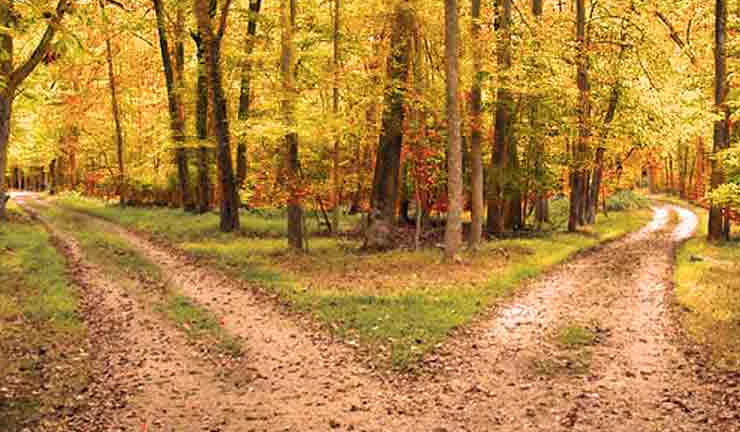 However, the path I'm going to take is uncertain. I need to narrow down some of these dreams in order to get on a path to becoming Future Shauna. I'm just not sure which one is my most urgent goal. Everything I'm doing now is in service to these goals, but it's been pointed out to me that I need to narrow my focus. The one thing I do know is that I have no desire to leave the classroom in a full-time capacity. I get energy from working with students and am not willing to give that up. Hopefully working with the Think Tank, Comment Consortium and inspirational colleagues will help me sort out the path I'd like to take. Day 11: What is your favourite part of the school day and why? Despite trying to create classroom routines, my days are aways different. It's hard to narrow down a favourite part of the day, as every day changes. There is one part of every day that is the same, though. My morning routine is really special to me. It's simple, but it starts the day off right. I meet the students on the yard, they line up in class order (by first name), we make sure we're in a 6S Line (single file, straight, silent, safe, slow, smiling) and head into the school. We greet our VP with a smile as we pass by her and say "Thank You" in sign language to the door holders. The students wait at the classroom door and pick up the mail from their individual mailboxes as they head into the room. My favourite part is that they walk in slowly, so that I have a chance to greet each student by name, make eye contact and start our time together with a cheerful "Good morning". The school day gets so busy that taking a moment to individually connect with each student is the best part of my day. Last year, our morning routine also included the students picking up their Chromebooks and filling out a "How Do You Feel Today?" survey. This allowed me to "take the temperature" of the room really quickly and students shared their stories with me. Starting my day like this helps the students and I connect and build relationships so that we can trust each other, realize we matter and work together effectively. 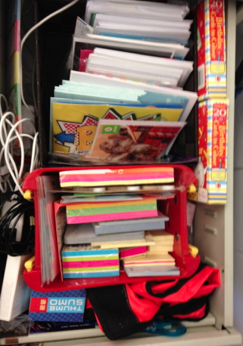 Day 8: What's in your desk drawer, and what can you infer from those contents? Students and parents know never to leave anything on "The Desk Monster". If they do, it could disappear forever. The top of my desk is usually a disaster with piles of forms, stacks of work to assess, my assessment clipboard, several picture books, at least 2-3 devices at a time, and bins of pleasing coloured pens. 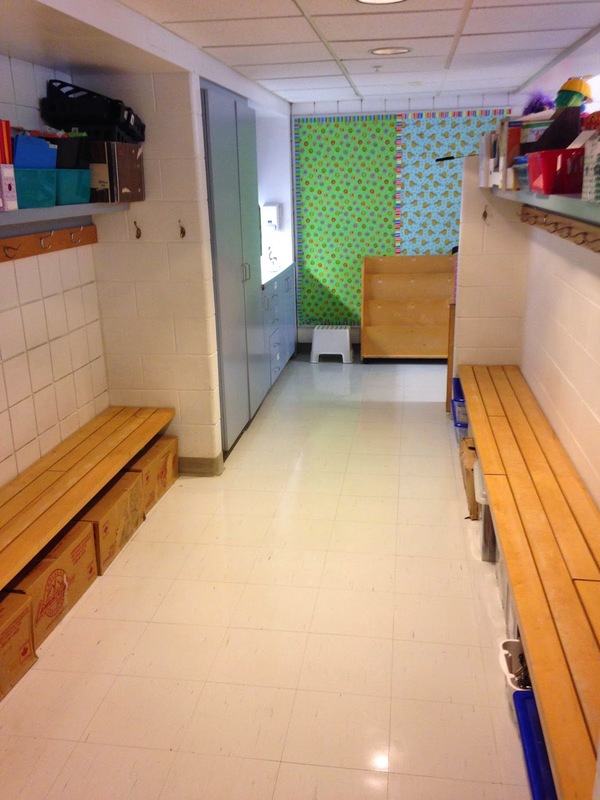 Last year, some of my lovely students said that what they wanted to do at the end of the year was clean my desk. I even got a handmade coupon to do so from one. My desk was such a disaster, I didn't want anyone else even trying to tackle it. 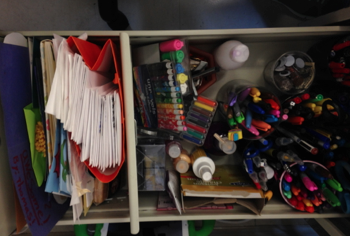 On the second last day of school last year, I spent longer than I'd like to admit sorting out my desk. So far, it's remained pretty good on the inside. The top of the Desk Monster isn't great, but I'm working on it! Here are the contents of my top drawer. Here are the contents of my bottom drawer. NOTE: It is absolutely NOT worth it to break into my desk to steal the change. There is not much. However, there is a small fortune in Sharpies and Papermate markers. My first (and forever) "work wife" is a colleague I had the pleasure to work with for several years. Changing schools four years ago was a great decision for many reasons, but I haven't stopped missing seeing Sara every single day. I was really lucky that she was assigned to be my "mentor" when I finally got a contract with the board. 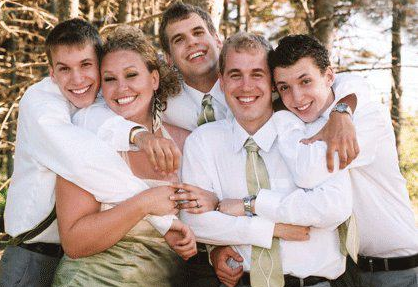 We'd already worked together for several years by that point, so formalizing it didn't change much. Any chance we've had to spend time together, though, we scoop right up. Sara is good for me professionally and personally. Those little voices I hear in my head? She's always there. There are those forever people in your life who you are so very lucky to meet. Sara is one of mine. No matter if we see each other everyday or once every few months, she remains one of the all-time most influential people in my life. Day 6: Explain: What does a good mentor "do"? I have had several mentors in my career, only one of them formalized. You'll hear more about Sara in my next post. Some mentors I have met, and others I haven't. Those I've Met: There have always been lots of awesome people in my building and I've had the opportunity to learn from them. Even before I became a teacher, I had some incredible mentors whose influence has been indelible. Those I Haven't Met (Yet): Being able to interact with people who I look up to and learn from through Twitter, blogs and other social media has become an integral part of my practice. 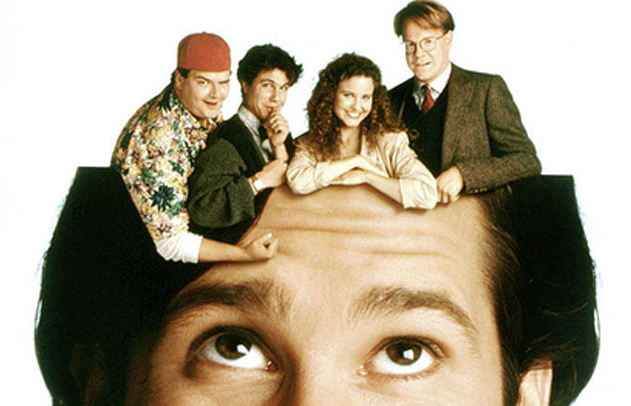 Do you remember the show, Herman's Head? Whether they know it or not, I have several mentors whose support, ideas and questions have affected me so deeply, they're basically stuck in my head at all times.